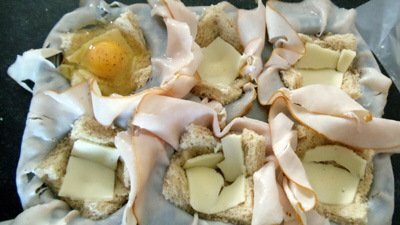 You have to try this breakfast recipe! This is a quick and easy way to make 12 little meals all at once with little prep and hassle. This is a tasty way to make your breakfast meal perfect for baby too! I originally saw this on Foodlets.com and thought it would be a great recipe for kids of all ages. It has always been important to me to send the kiddos off to school with as large of a breakfast as possible; breakfast is their “fuel meal”. I like to call it a “fuel meal” because this is the meal that is and always has been the one meal that they eat with gusto! I try to include as many food groups as possible – and then some! This recipe is quite simple but I warn you, a bit messy to make. What I love about it is that there is a baby food opportunity here – see that luscious egg yolk…… Visit the WBF eggs for babies page to learn more about feeding babies eggs! So you will need 12 eggs if you are filling a 12 muffin muffin tin etc.. I only made 6 this go-round as I didn’t want to waste any eggs in the event of a #Fail! Step 7: Fold the meat over to “close”. Bake for 20-30 minutes until the eggs are firm. You may find that the yolks are soft and if this happens, simply finish the job in the microwave. Be sure to take the egg muffins out of the tin first 🙂 The tin should not go into the microwave! Want to save this recipe for later? Be sure to pin it on Pinterest!